You are here: Index page Guide How does GPS tracking work? ... how GPS tracking works like in hollywood movies? A flashing red circle around a car icon on a map on screen and an annoying beep - beep - beep noise? It is not really as complicated as it sounds. Nowadays GPS tracking systems cost less than a tank filling. Usually the GPS tracker setup is easy and done by SMS messages and sometimes by an USB cable. Let us find out how it works and what you need for tracking your car, your motorcycle, or whatever you want. ... but without LCD display and without keypad. It doesnt need much. Just a SIM card, a GPS chip, a GSM chip and a small CPU. The GPS chip queries its position by some geostationary satellites in the earth orbit. The GPS chip is not communicating with the satellite in both directions but it receives signals from there so the chip can calculate its position. This is called unidirectional communication. The GPS chip forwards its position location data to the CPU which will cleanup and purify these data. Now these data are forwarded to the GSM module. The GSM module now connects to the cellular network and the target. You are the target. But you cannot receive that data directly, these data are sent to you by a short message (SMS) so you can read the location data in a plain format like latitude 53.53 and longitude 8.06. Now you can enter the coordinates into google maps and see where the car is driving. Easy, isnt it? No. That is quite inconvenient. So most trackers send a direct google maps link url to you by SMS. You need to click that link, watch, that is everything. Uncomplicated, isn't it? No, still not. A GPS tracker will reveal its full functionality if you use a GPS tracking platform. The GPS tracker wont send the location data by SMS anymore, that is annoying and expensive. The tracker connects to a GPS tracking server automatically and sends its data directly to the server. The GPS server will now store these data in a database and each time you login to your GPS tracking platform account the server will push the location to your home screen, tablet or mobile phone. Simple? Yes, that's really simple because the GPS Tracker setup to send data to a GPS tracking platform is usually not really difficult. Just send a couple of SMS to the number of the SIM card in the tracker, the tracker will reply something like "command xyz okay" and after that you can start. Using the Track history playback means that the GPS Tracking server automatically stores your location data from the GPS tracker so you can view them later. Just imagine you would do that by your sms messages. Do you want to open hundreds of SMS per day? A tracking platform does all the work. You just need to buy a GPS tracker and a SIM card. Just have a look to our section GPS tracker for vehicles and FREE GPS tracker sim card in UK. 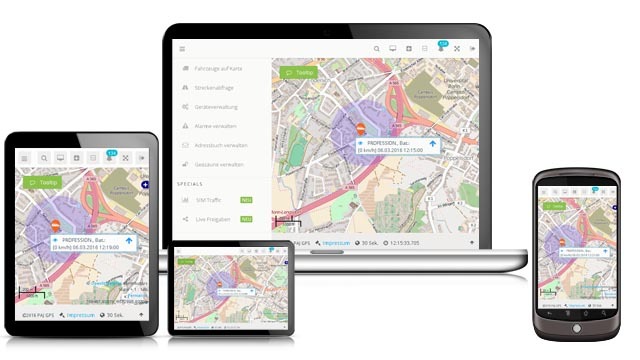 If you would like to track your GPS tracking system online you can register your FREE GPS tracking platform account now.